Newcastle United have returned to the top 20 of the Deloitte Football Money League - becoming one of the world's highest earning football clubs. Figures from Deloitte’s Sports Business Group show the revenue generated by the Magpies from the 2017/18 campaign - piling further scrutiny on Mike Ashley's ownership. Figures from Deloittes Sports Business Group pile furtherscrutiny on Mike Ashley's ownership. United had dropped out of the top 20 rich list in 2017 after the club's turnover deteriorated to £85.7m following their relegation to the Championship. However, an immediate return to the Premier League, which saw Rafa Benitez's side secure a 10th place finish, has lifted the Magpies back among the world's elite. 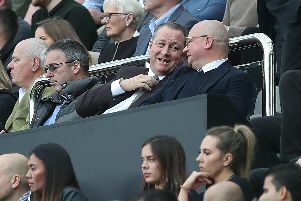 Newcastle, on its own, generated a £178.5m revenue last season - a figure which rightly raises questions surrounding Benitez's limited transfer budget. Ashley announced in 2017 Benitez "can have every last penny that the club generates" and reiterated his statement last summer. Despite the Sport Direct tycoon's double promise, the 58-year-old was sanctioned just over £20million on seven new signings last summer. Compare that to Bournemouth - who don't feature in the top 20 - spending £25m alone on Jefferson Lerma from Levante. Fast forward five months later and still Benitez is required to shop for hard bargains, with the Spaniard attempting to maximise the loan market. Out of the top 20 - made up of nine Premier League clubs - broadcast revenue remains the largest individual income stream, comprising 43% of total revenue. The Magpies reportedly received over £74m off domestic and overseas TV deals last term. A noticeable trend in this year’s Deloitte edition has been the growth in commercial revenue for clubs at the top of the Money League, which now represents 40% of total revenue. Matchday revenue remains unchanged at 17%. Sam Boor, senior manager in the Sports Business Group at Deloitte, said: “The substantial presence of Premier League clubs continues to be felt in this year’s Deloitte Football Money League. "However, with the Premier League’s tender for the next cycle of domestic rights from 2019/20 complete and sale of overseas rights nearing conclusion, it is clear that Premier League clubs will be unable to rely on explosive growth in broadcast distributions as a source of future growth, as has been the case in recent years.